How can we deal sparingly with environmental resources such as water, fossil fuels, or wood? How are we supposed to manage the energy transition? Like leitmotifs – these issues crop up again and again in the daily work routine of Erik Gawel at the Helmholtz Centre for Environmental Research (UFZ). 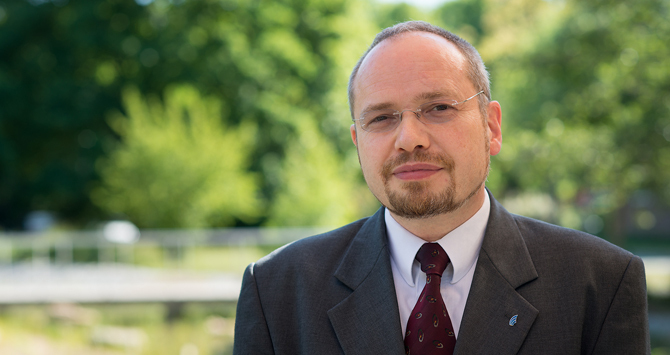 For Erik Gawel, the Helmholtz Centre for Environmental Research (UFZ) is an ideal location. Not only because it gives the appearance of an idyllic biotope on the campus of the Science Park Leipzig with its wild bushes and grasses all around a fire pond; rather, it’s mostly because different scientists from numerous disciplines – in seven subject areas and 37 departments – jointly pursue essential research issues and projects. The difficulty, he continues, is to motivate people to voluntarily behave in an environmentally friendly manner. “That only works to a limited degree, since it ultimately is at odds with our natural selfishness. This is why I am examining how framework conditions could be changed in such a way that man’s self-interest can be ‘put to work’ for nature,” explains Gawel. Examples for this are an ecology-tax and emissions trading. “The limitations of economic growth, as were previously formulated by the Club of Rome in the 70s, have not come into play in this manner. It begs the urgent question: How can one actually illustrate, with scientific validity, such predictions, such interactions between man and nature?” – thus Erik Gawel describes his motivation as research scientist. Currently, he is providing his expert knowledge in various large research projects. For example, the leading-edge cluster “Bioeconomy” from the Federal Research Ministry – a collaboration between the industrial sector and various research institutes. Gawel and about one-dozen further UFZ scientists, including engineers and legal practitioners, have assumed the accompanying research. The objective of this think tank is to examine how viable innovative structures can be created for the use of wood, while still enabling sustainable economies. Economic, technological and legal possibilities are sounded out by the research scientists. For Gawel, this is a very exciting area: “This goes far beyond the classic application of wood as a material for construction and/or fuel. For example, how various components of wood can emerge for entirely new uses, e.g. as a substitute for crude oil in the chemical industry.” A central macro-economic issue here is how incentives can be created for such a use of material – before the rest is utilised for firewood. Science journalism is at crisis point: Editorial offices and departments are being scaled back, budgets are being cut. But should the scientific community finance the coverage of its own work? Two points of view. Who are the best doctoral candidates at Helmholtz? At the Helmholtz Horizons event in Berlin, six young researchers were recognized for their outstanding scientific achievements. In these brief interviews, they discuss the focal points of their research and their plans for the future. Israel has been home to astounding scientific achievements. Physicist Daniel Zajfman, one of the country’s most noteworthy researchers, believes this success is due in part to a willingness to think outside the box and cross boundaries.